It's a a new month, which means it's also time for a new Magpie of the Month! 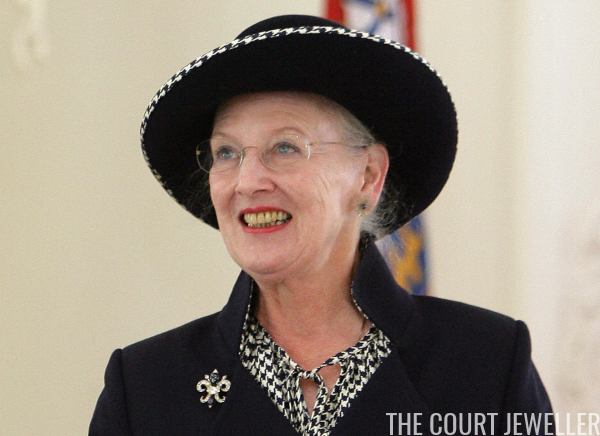 This April, we're celebrating the jewels of Queen Margrethe II of Denmark, who turns 78 this month. Margrethe's jewel box is one of the most interesting in Europe, filled with heirloom pieces, sentimental items, and modern jewels. Today, we're kicking things off with a look at a classic piece: her Sapphire Fleur-de-Lis Brooch. The sapphire and diamond brooch is a family heirloom, reportedly going back at least three generations in the Danish royal family. 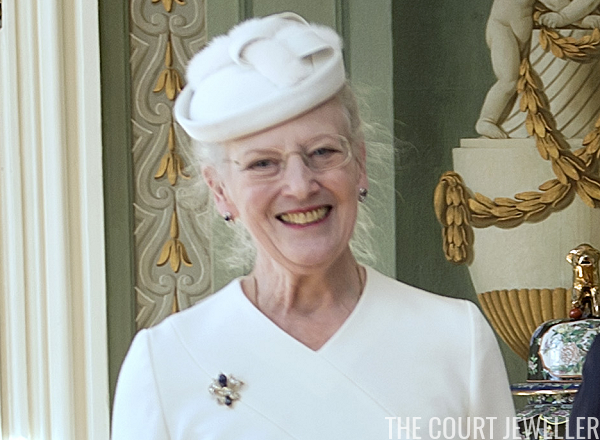 There are photographs of Queen Ingrid wearing the brooch, and now, Queen Margrethe is the primary (perhaps even exclusive) wearer of the piece. 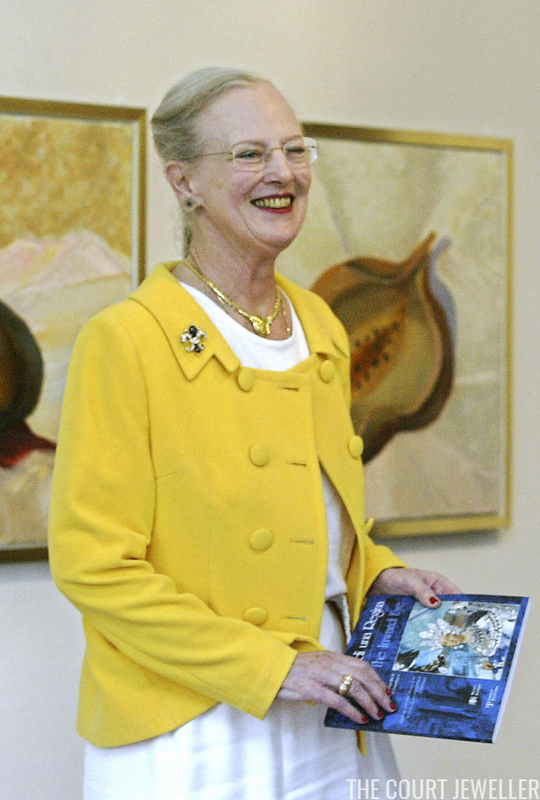 Margrethe often wears the brooch, which is set with diamonds and cabochon sapphires, against dark clothing, but during a May 2006 visit to Italy, she paired it with a bright yellow jacket. She uses the brooch in a versatile way, but she primarily wears it for day occasions and even important government functions. In October 2008, she chose it for the opening of the parliamentary session in Copenhagen. 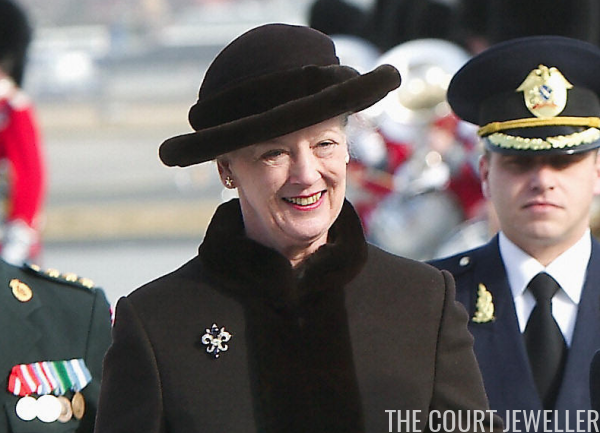 Here, she wears the brooch for a diplomatic event: receiving the President and First Lady of Finland in April 2013. I like the brooch best with solid colors, but the diamonds tend to recede a bit against a white outfit like this one. 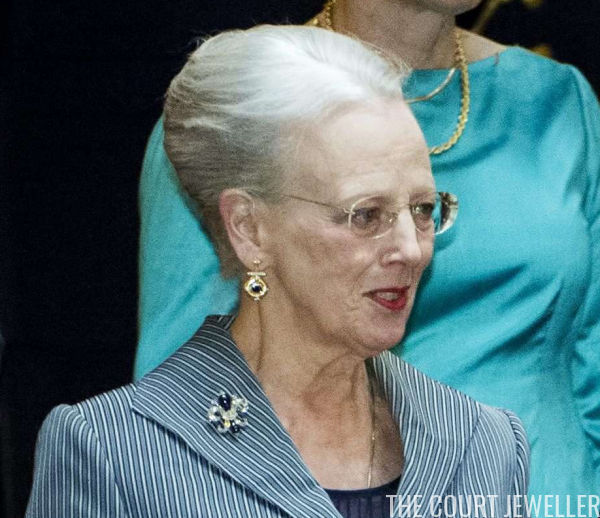 In 2010, Margrethe wore the brooch for an important family event: the wedding of her nephew, Prince Nikolaos of Greece and Denmark. 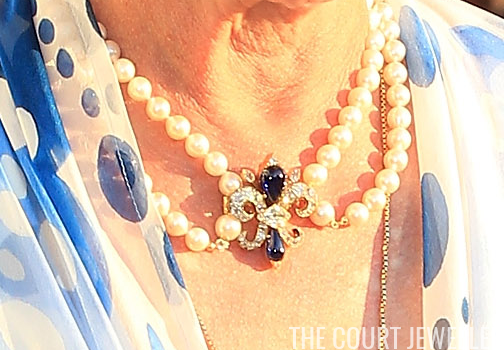 On this occasion, she used the brooch as an ornament on a pearl necklace. The wedding appearance gave us a clear look at the brooch's details. Here, you can see the large diamond that sits in the center of the piece. You can also see some design similarities between this brooch and the pearl and diamond fleur-de-lis brooch worn by the Grand Duchess of Luxembourg. 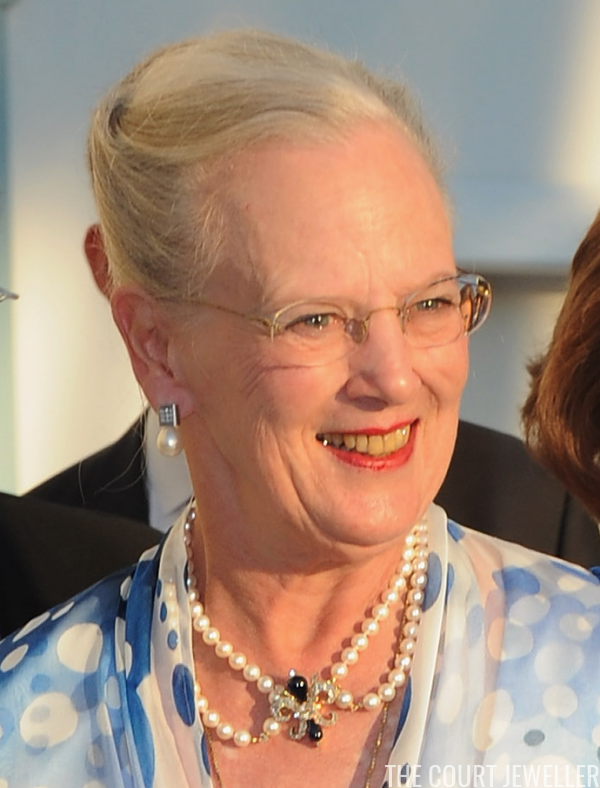 One of Margrethe's more recent appearances in the brooch came in April 2015, when she wore it for the Sibelius-Nielsen Festival in Stockholm. The fleur-de-lis is a traditionally French design symbol, connecting the piece to Margrethe's late husband, Prince Henrik. I wouldn't be surprised to see this one worn more often in the wake of his recent death, as a sort of quiet bejeweled tribute. 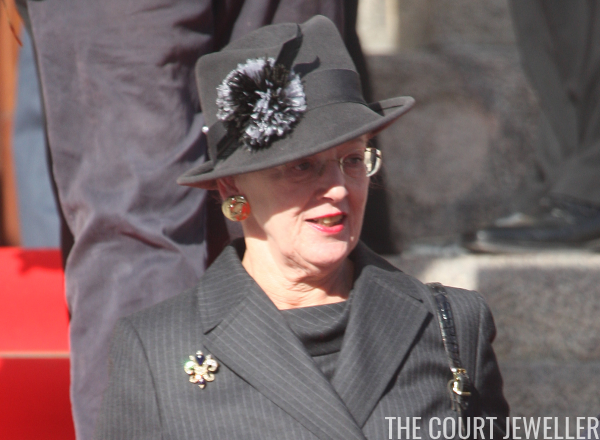 The brooch would also be a natural loan to Margrethe's French-born daughter-in-law, Princess Marie.